The Indian chess legend, who starts the defence of his World Championship in Chennai this week, has long-established connections with Russia, where he remains popular among the intellectuals. When I told a Russian colleague about Garry Kasparov’s rather antagonistic comments against world champion Viswanathan Anand, he shrugged them off and said that the chess star-turned political activist seems to have an axe to grind with just about everybody these days. This particular colleague has been following the developments in the world of chess since he was a child and proudly says that his favourite Indian celebrity is Anand, who he saw playing a game against Vladimir Kramnik at the Kremlin in the 1990s. Anand is one of the most popular Indians among Russia’s intelligentsia, members of which seem to know a lot more about the Grandmaster’s career than people in his own country. In 2007, when he won the fifth of his six Chess Oscars, a Russian university professor at a party approached me to shake my hand and congratulate me on my compatriot’s achievement. Not wanting to offend this man, who was being sincere and classy, I thanked him but added in the nicest of ways that it would be rather shameless on my part to accept these congratulations since this wasn’t even close to being my personal achievement. Only Kasparov and Anatoly Karpov have won more Chess Oscars than Anand, but the 22-year old Norwegian sensation (and the challenger at the World Championship) Magnus Carlsen, has won the last 4 in a row and looks to unseat the Indian at least in this department. Many of my Russian friends are rooting for Anand to defend his title in Chennai, but the odds do look stacked against the Indian legend at the moment, when one considers the form that the challenger has been in over the last few years. The championships that start on November 9 are a great advertisement for the game that originated in India. Anand’s achievements, which are often overlooked in cricket-crazy India, have never gone unnoticed in Russia. “I always considered him to be a colossal talent, one of the greatest in the whole history of chess,” Grandmaster Vladimir Kramnik told whychess.com two years ago. “I think that in terms of play Anand is in no way weaker than Kasparov but he's simply a little lazy, relaxed and only focuses on matches. In the last 5–6 years he's made a qualitative leap that's made it possible to consider him one of the great chess players.” Kasparov, who seems to have had a recent fallout with Anand, helped the Indian legend in his preparations for the 2010 championship. 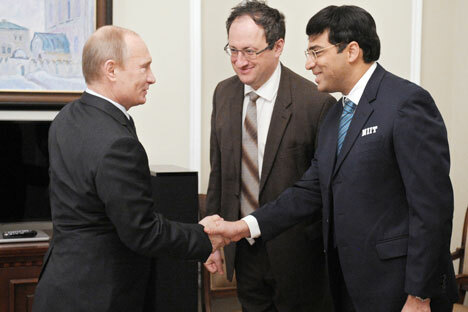 ‘Vishy’s’ victory in 2010 is looked upon by many in Russia as his greatest, given the circumstances. The Indian legend defeated Veselin Topalov after undertaking an epic 40-hour road journey across the heart of Europe just to reach Sofia from Frankfurt, in the wake of the cancellation of all flights following the ash cloud from the Icelandic volcano Eyjafjallajökull. A Moscow-based friend and chess coach who followed the 2010 championships closely justifiably certified that victory as a heroic effort against all sorts of circumstances. Anand will have the familiar environs of Chennai when he takes on Carlsen, but this will be his toughest ever championship clash. The Indian grandmaster lost very badly to his Norwegian challenger at the Tal Memorial event in Moscow in June and said the experience was embarrassing, while heaping praise on the opponent who is 21 years his junior. Over the next few weeks, chess fans are in for a real treat and despite being a heavy underdog, a large number of enthusiasts in Russia and India will be hoping that the one of the game’s all-time greats can pull off another magical spell and win his 6th World Championship and stay the undisputed World Champion, a title he has held since 2007. Whatever happens between Saturday and the end of the month, there is little doubt about Viswanathan Anand’s legacy as one of the greatest champions India has ever produced in any sport.